The What: As businesses and organizations continue to use remote communications technology to bridge distances and share ideas, there has been a proliferation of huddle room and small meeting rooms demanding technologies that are more convenient and enable a seamless collaboration experience, so users can easily come together to exchange information, share ideas, and collaborate at any time. Yamaha has announced the CS-700, an all-in-one collaboration solution specifically designed to support these environments. The CS-700 combines best-in-class audio with high-quality video to fulfill huddle room requirements and collaboration capabilities in one wall-mounted system. 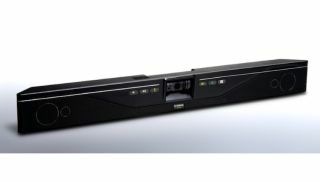 Yamaha entered the conferencing market in 2006, offering leading microphone and speaker systems, including the YVC-1000 USB and Bluetooth conferencing phone. In 2014, the company acquired Revolabs, a provider of audio solutions for unified communications and enterprise collaboration. Together, these companies deliver solutions that ensure participants in remote conferences can hear and be heard clearly in every meeting environment. The Yamaha CS-700 is the first solution of its kind to bring together comprehensive audio, video, and collaboration capabilities in a wall-mounted system. Combining Revolabs’ expertise in microphone technology, Yamaha’s leadership in loudspeaker engineering, and new high-quality video and screen sharing capabilities, the CS-700 provides an affordable, simple-to-install, high-fidelity system for successful teamwork from a single USB connection.